As part of taxable bond fund, world bond is another popular option for investor to buy fixed income mutual fund. 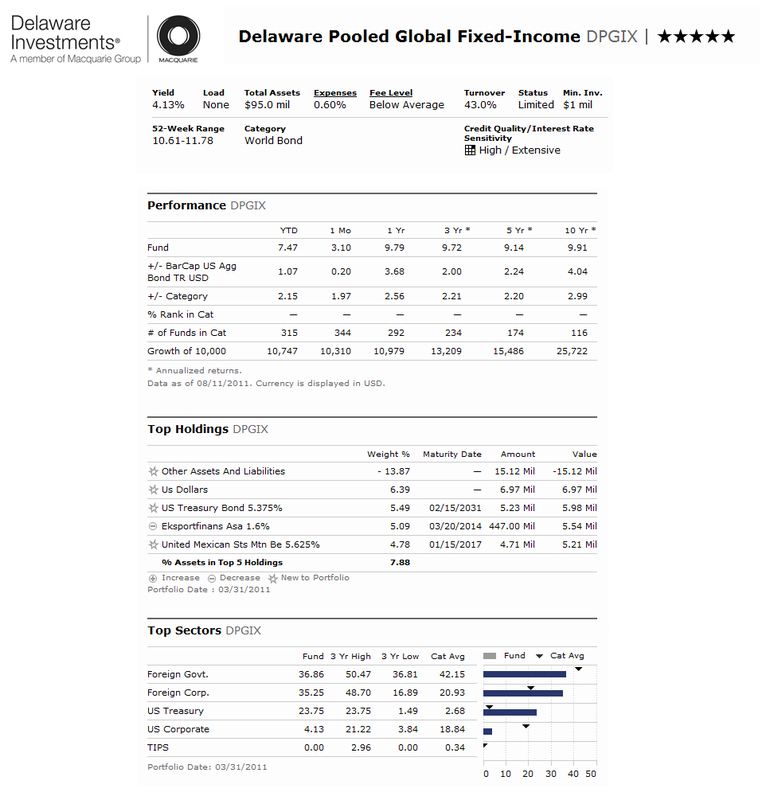 One of the best rated world bond funds is Delaware Pooled Global Fixed Income fund. The following is the fund's review. 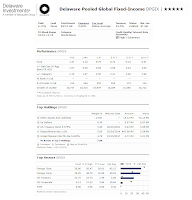 The Delaware Pooled Global Fixed-Income fund objective is to provide current income consistent with preservation of capital. This Delaware Investments fund invests >80% of net assets in fixed-income securities. As a global fund, this DPGIX fund invests in bonds located throughout the world. The fund invests >40% of its total assets in securities of non-U.S. issuers. It invests in a broad range of fixed income securities, including debt obligations of foreign and U.S. companies that are generally rated A or better by rating agencies (S&P or Moody'), and foreign and U.S. government securities. This taxable bond fund is non-diversified. This fund has no 12b1 fee and there is no sales-load fee. It has gotten 5-stars rating from Morningstar. This fund is managed by Joanna G. Bates, John Kirk and Christopher A. Moth since July 1999. This top rated world bond fund can be purchased from a limited of 6 brokerages. They are Northwestern Mutual Investor Service, LLC, Robert W. Baird & Co., Sterne, Agee & Leach, Inc., Thrivent Advisory Eligible, Trade PMR Transaction Fee and MSSB MassMutual. Its total net assets is rather small than other best fund with $94 million. The annual expense ratio of this best rated bond fund is 0.60%. It also has a yield of 4.23%. This fund has returned 12.03% over the past one year and 10.20% over the past 10 years. It has experienced 15 years with positive return and 3 years with negative return. The best return was recorded in 2002 with 26.17%. The top sectors of this DPGIX fund as of March 2011 are Foreign Government (36.86%), Foreign Corporate (35.25%), US Treasury (23.75%), and US Corporate (4.13%).